Vitiligo is a type of autoimmune disorder that causes the loss of color in patches of skin and sometimes hair, mucous membranes (like in the nose or mouth), and eyes. 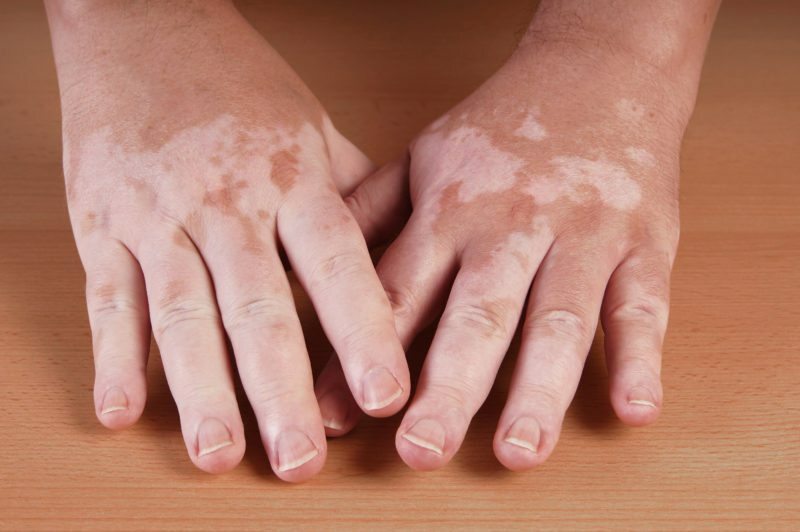 When a person has vitiligo, the cells that normally produce skin color, called melanocytes, die or stop working properly causing white patches to appear. These patches are most often first seen on the hands, feet, arms, and face, parts of the body that get the most sun exposure. However white patches can also appear on other parts of the body and can spread over time. Doctors still do not know what causes vitiligo and cannot predict who will get it or whether it will spread. Most people with vitiligo begin seeing white patches in their twenties but it can develop at any age. There are no other medical symptoms of vitiligo. There are some treatments for the skin patches but there is no cure to stop the appearance of more white patches. Vitiligo is not the only skin condition that results in depigmented skin. It’s important to know what how vitiligo is different than other conditions, some of which are caused by fungus and bacteria infections. Piebaldism. Piebaldism is a genetic skin condition where there is no melanocytes on parts of the body. Unlike vitiligo, piebalism affected areas of the skin do not repigment. Pityriasis alba. Pityriasis alba begins with red scaly patches on the skin that develop, heal and leave behind depigmented areas. Tinea versicolor. Tinea versicolor is a skin condition where there is too much of yeast in the skin causing small depigmented areas on the body. Leprosy. Leprosy, in certain parts of the world is still a regularly occurring condition. In those parts of the world, such as India, vitiligo can be confused with leprosy. With leprosy, symptoms may include a lack of ability to feel pain, loss of parts of finders, toes, hands or feet. Weakness and poor eyesight may also develop due to leprosy. But vitiligo is nothing like leprosy and is not contracted by human contact. Vitiligo is not contagious! Albinism. Albinism is is a hereditary disease, unlike vitiligo, and is not caused but damage to melanocytes. Albinism affects the whole body, while vitiligo affects patches of skin, but may spread to the entire body over time. Vitiligo is much more than skin-depigmentation for those who have it. The internal medical issues associated with vitiligo are important to discuss because unaddressed these issues will continue to manifest. Common issues that often go along with having vitiligo are: digestion, poor thyroid function, vitamin and mineral deficiencies. It’s worth consulting with a health professional about these issues if you have vitiligo. The internal emotional struggle often associated with vitiligo can be difficult for the person with vitiligo and is perhaps the most important to understand. It’s important to remember that each person is different and each situation is different. What does it feel like to have vitiligo? Because of the random, and seemingly uncontrollable progression of vitiligo, many people suffer from anxiety, depression, poor self-esteem, social anxiety and professional anxiety. Because vitiligo is an uncommon and unwelcome change to the appearance in our world where appearance holds such power in many cultures, it can be difficult to deal with. Vitiligo confronts our self-image, vitiligo confronts our ideas about what’s in our control and not in our control, vitiligo, confronts our ideas about what other people think and feel about us and it effects our imagination about what’s possible in life. The truth about vitiligo is simple: it’s doesn’t change anything except skin pigment. Our potential for a happy, fulfilled life is not changed by vitiligo, but its understandable why someone might feel otherwise. How will the random and seemingly uncontrollable changes to their physical appearance effect their lives? How will other people react to the changes in appearance from vitiligo? Will it be more difficult to find a job? Will it be more difficult to find love? Will people think less of someone because of vitiligo? These questions and others can often lead to a period of depression and confusion. That hardest thing to come to terms with for myself is this: vitiligo changes skin pigment but doesn’t really change anything else. But people do come to terms with vitiligo successfully. People get married, have children, work, progress in their careers, build businesses: people live with vitiligo successfully everyday, just like people learn to live and love while dealing with cancer, heart disease, diabetes and every other kind of medical issue. Vitiligo doesn’t need to destroy your life! It seems like vitiligo changes everything including appearance, likability, desirability, social standing, job eligibility, but in reality with the right attitude and awareness, vitiligo doesn’t negatively effect the potential for a full and good life. Vitiligo is just another thing in life that we must learn to respond to with a good attitude. If approached in this way, vitiligo looses its power over out lives. What can you do about vitiligo? Getting rid of vitiligo from your head and heart is a powerful act and is perhaps more important than getting rid of vitiligo from your skin. Life will continue to present challenges. Vitiligo is just one such challenge. Learning to deal with vitiligo with the right attitude is a great way to learn how to deal with any kind of challenge. What can we learn from vitiligo? What ways can I grow as I deal with vitiligo? Who do you need to ask for help to better deal with vitiligo? Where can you get this help? How can you support others? While vitiligo can be frustrating, it can also be a source of strength, if approached with the right attitude. What is vitiligo? It’s really up to you.